Why, for instance, do i get stuck at 28 / 54 items? Not all items are available the whole year. Just try again on special holidays or events to discover new ones. Right now there are special items for Christmas and Halloween, but there will be more soon. Do I really have to shake hundreds of times to discover all items? The “Royal Globe” for Android has some more functions than the iOS version: shake, touch or swipe until your favorite illustration appears inside the snowglobe, then click on the litte camera symbol. Now facebook, twitter, dropbox or mail it with your own personalized greetings inside the name tag. 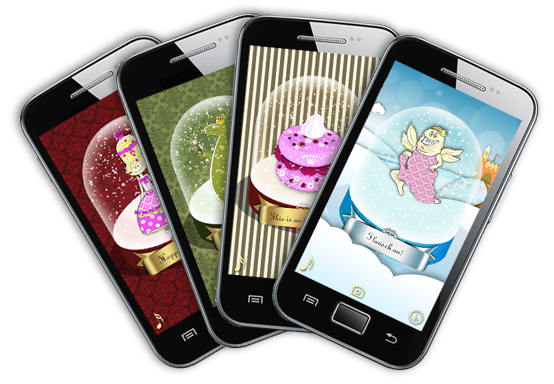 The “Royal Globe” for Android has 4 changeable backgrounds: different baroque designs and a winter scenery. Please note that there are also some cute animated and interactive live wallpapers for your android desktop. Have fun and enjoy a wonderful snowy winter!